Ann Wolters has been a writer, consultant and writing coach since 2008. Her work has appeared in "The Saint Paul Almanac" and in magazines such as "Inventing Tomorrow" and "Frontiers." She earned a Master of Arts in English as a second language from the University of Minnesota. High-fiber foods generally have five or more grams of fiber per serving. Eating a diet with sufficient fiber offers several potential benefits, including protecting against colon cancer, lowering LDL or bad cholesterol and helping to prevent heart disease and diabetes, according to the Nemours Foundation. If you currently have a low-fiber diet, increase your fiber intake gradually in order to allow your digestive system to adjust to the change. Drink plenty of fluids as well. Consuming dried fruit can be a tasty way to add more fiber to your diet. 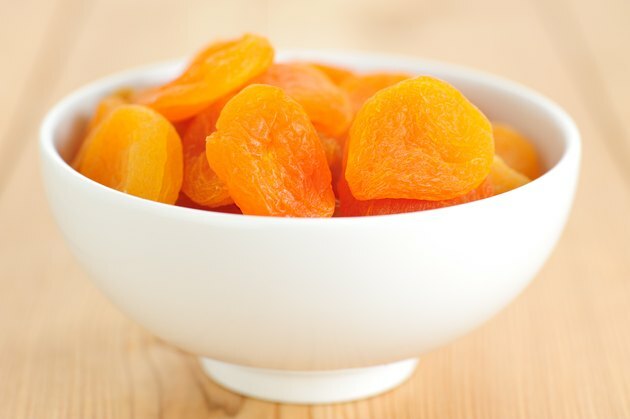 With 4.7 grams of fiber per 1/2 cup, dried apricots make a sweet, fiber-rich snack by themselves. They also add a pleasant taste to a variety of dishes, from salads to entrees to desserts. Mix diced dried apricots into chicken or pork dishes, pilaf, salsa, cobbler, muffins or cookies to add a sweet and tangy zip and increase fiber content. Dates contain 5.9 grams of fiber per 1/2 cup. They make a wonderful dessert themselves, served whole, but you can also mix them into bread pudding, cookies, quick breads or cakes and reduce the amount of sugar in the recipe. Try chopped dates added to salsa or salads, or stuff dates with a cream cheese, bleu cheese and green onion mixture. You can blend dates into your favorite shake. For a sweet start to your day, whip butter, stir in cinnamon, nutmeg and chopped dates and spread on toast or bagel halves. With 7.3 grams of fiber per 1/2 cup, figs may have the highest fiber content of any dried fruit. You can stir chopped dried figs into oatmeal or granola or blend them into smoothies. Figs add a delightful flavor to chicken, pork or lamb stews as well as just about any pilaf. Combine a cup of chopped dried figs and a cup of pinot noir with 1/3 cup wine vinegar and sweeten with maple syrup to make a unique chutney. Prunes have earned their reputation as high-fiber fruit; a 1/2-cup serving contains 6.2 grams of fiber. Though prune manufacturers have tried to update their product's image by calling them dried plums, the nutritional benefits remain the same. Prunes add flavor and fiber to barbecue sauce, stuffing, salads, dressings, muffins, cakes and cookies. They are also a tasty snack in their own right. Are Dates Good for Weight Loss?